studied at the Musikhochschule Trossingen and at the Koninklijk Conservatorium Den Haag, where he received his masters for specialising on baroque cello and historical performance practice with Jaap ter Linden. In 1991 Nils won the first prize and the 'Rovere d'Oro Special Prize' at the Rovere d'Oro competition in Italy. In the nationwide competition "Jugend Musizert" in Germany he won the first prize in 1993. At the early music competition Musica Antiqua Brugge 2000 he won a 2nd price. For the past years Nils has performed widely as a baroque cellist with various chamber music groups and and orchestras in most of Europe, Japan, the United States, the Middle-East and Russia. In 1998 he was selected as first cellist of the European Union Baroque Orchestra. 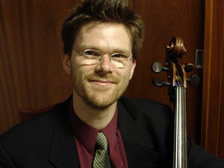 Nils Wieboldt is principal cellist of Les musiciens du Louvre-Grenoble (Marc Minkowski) and Al Ayre Espanol (Eduardo Lopez-Banzo). He has appeared as cello soloist with L'Orfeo Barockorchester and the Leidse Barok Ensemble. Nils has played with The Orchestra of the 18th Century (Frans Brueggen), Nederlandse Bachvereniging (Jos van Veldhoven / Gustav Leonhardt), Utrecht Barok Consort and the Mozart Akademie in the Netherlands. Recent engagements include also playing as principal cellist for the Academy of Ancient Music, UK, Cappella Figuralis, NL, Rheinische Kantorei,D. In 2002 Nils has been contracted as a guest teacher at the University of Stellenbosch, South-Africa. He has participated in numerous broadcastings for, amongst others, BBC Radio, SWR Radio Stuttgart, WDR Koeln, and NCRV Television (Holland). Nils plays on a rare baroque cello by Jaques Boquay (1710). (readable by most word processing programmes).